You are here: Home / Mechanical Engineering student selected for J.K. Tyres. / Placements / Mechanical Engineering student selected for J.K. Tyres. 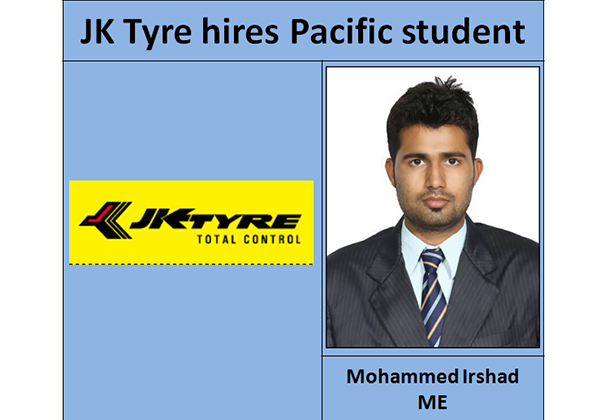 Mechanical Engineering student selected for J.K. Tyres. Congratulations to Mohammed Irshad, Mechanical Engineering students for selection in J.K. Tyres. http://www.pacific-it.ac.in/wp-content/uploads/2018/03/5.png 420 600 nirbhay http://www.pacific-it.ac.in/wp-content/uploads/2017/06/PIT-black-resize-1-min.png nirbhay2017-11-20 11:30:052018-05-23 11:05:08Mechanical Engineering student selected for J.K. Tyres. Mechanical Engineering students selected for Wonder Cement. Mechanical Engineering student selected for Reliance Industries Limited.